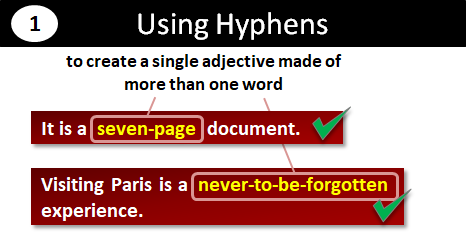 This page offers an explanation on the correct use of hyphens and gives examples of hyphens used in sentences. Hyphens are joiners. They join the words in a compound adjective (e.g., six-foot table, silver-service waitress), and they join the words in compound nouns (e.g., paper-clip, cooking-oil). They can also join prefixes to words (e.g., ultra-expensive, re-establish). Hyphens are used to join words to show they are a single entity. Hyphens are used to join the words in compound adjectives. A compound adjective is a single adjective made up of more than one word. (1) Make it easier to read. (2) Showcase your writing skills a little. (3) Remove the possibility for ambiguity. A single noun made up of two or more words is called a compound noun (e.g., ice axe, water-bottle, inkwell). The big question with a compound noun is whether to leave it as two words (e.g., ice axe), to put a hyphen between the words (e.g., water-bottle), or to create a new word (e.g., inkwell). Unfortunately, there is no simple rule for this. You have to know how to spell the word. Occasionally, more than one version of the word is acceptable (e.g., paper clip, paper-clip, and paperclip are all acceptable). The big question with a prefix is whether to use a hyphen with it or not. 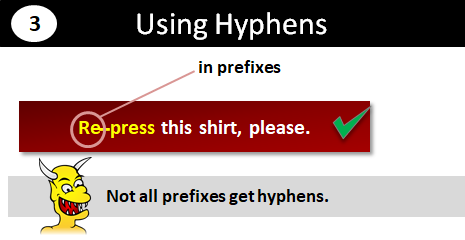 The guidelines on when to use a hyphen with a prefix are here. Unfortunately, the guidelines are not simple, but, often, the hyphenated and unhyphenated versions are both acceptable. As a general rule of thumb, try to avoid using a hyphen. However, if the unhyphenated version looks too unwieldy for your taste (antiaircraft might be an example), is highlighted as spelling mistake by your spellchecker (e.g., reestablish), or is ambiguous (e.g., recover), then go for the hyphenated version. Here is an interactive test on using hyphens:.